If I'm allowed to be a bit superficial to start, and dammit I am, I have to say that this book, as an object, is gorgeous. The cover is a smooth rustic brown paper printed with a clean olive-green design, cut perfectly flush with the pages it binds. It is so well-made, I cared for this book's well-being. Ugly Duck Press deserves whatever buzz they get if they produce pieces of this quality, especially for limited runs. 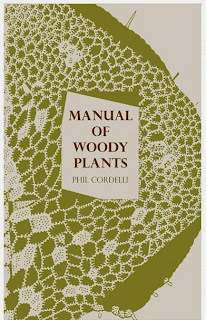 Phil Cordelli's Manual of Woody Plants is a puzzle, but not one that's meant to be solved. I am the first to admit that my taste in reading, especially in poetry, may be more conservative than many. When encountering the work of poets who seem to embrace the language school of poetry's bafflingly loose regard for form, grammar and syntax, I feel that I lack the training and the vocabulary to properly appreciate what I am reading. And, well, I like grammar and syntax, it seems such a shame to me when it is deliberately eschewed. Yet I refuse to dismiss Cordelli's Manual so easily, because this is clearly a book that was carefully written, and any rule that he breaks, he does so with obvious intent. Ostensibly formatted as a sort of field journal, Manual is organized by plant type (Decidious, Coniferous, Pines, Shrubs, etc), and each poem is a plant's scientific name in Latin. Every entry approaches its title differently; some are basically descriptive poems, detailing the plant subject in a lyrical fashion. Other poems use the title as a jumping off point for some personal memory, or other topic. There are various sketches and doodles interspersed throughout the book, marginalia that one would find in an actual field journal, lending to the illusion. Most of Cordelli's poems are disjointed in some fashion, rarely does one line follow into the next without some unexpected indentation, punctuation, or mid-word caesura. He hints at his process in the acknowledgments, some combination of collage, cropping, rearranging, and remixing. A less explicit, but perhaps more meaningful explanation of his technique is found in Aesculus hippocastanum: “This is how I would rewrite it:/ poke holes underneath each letter/ and breathe through them”. Still there are other poems that are entirely unrecognizable to me, that are deconstructed beyond anything that I would recognize as a poem – I'm not convinced a series of backslashes can be considered a stanza. Hell, I don't even know what a backslash sounds like. My suspicion is that my hard-to-ignore impulse to understand them is the very reason why I will never truly understand them. to know that it has meaning. 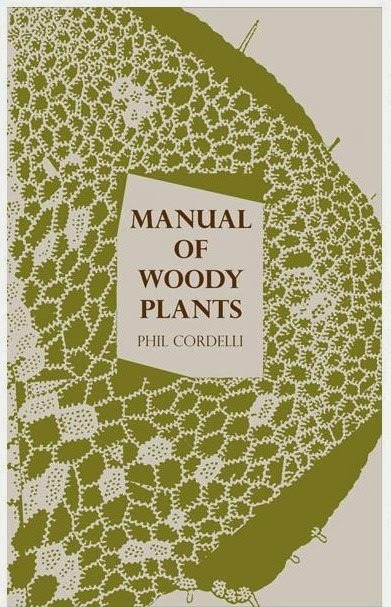 Purchase Manual of Woody Plants HERE.